I discovered a super blog today. Turn Right at the Sarcophagus is a fascinating collection of horse related posts from... Egypt! 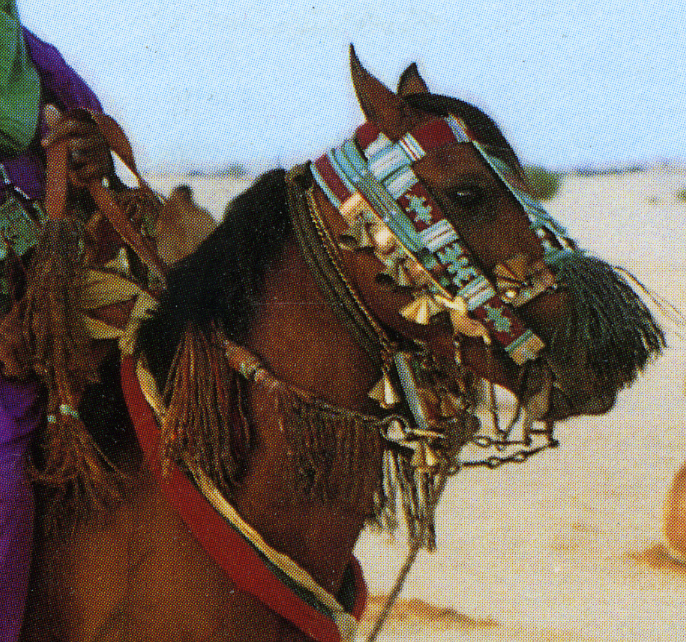 The author, Maryanne Stroud Gabbani, offers tales of riding and horses in Egypt, as well as commentary on international horse issues and events. Take a look! What an interesting set of armor for horse and rider! 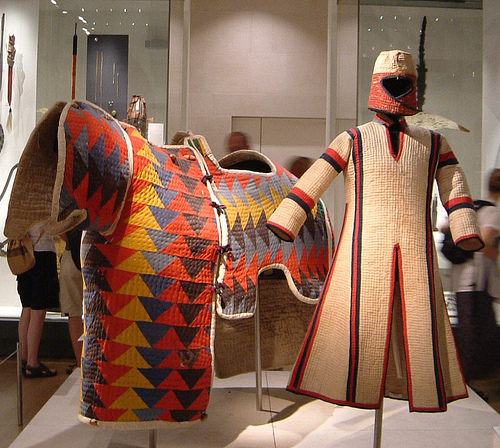 These are from the Sudan, made of quilted fabric, and housed at the British Museum in London. "This horse armour is made from several pieces of brightly coloured cloth sewn together. They are stuffed with kapok, the wool-like strands that surround the seeds of the silk cotton tree, creating a heavy garment. In full battle the war-horse would also have worn chainmail or pieces of leather across the flanks. A headpiece of metal and cloth completed the outfit. 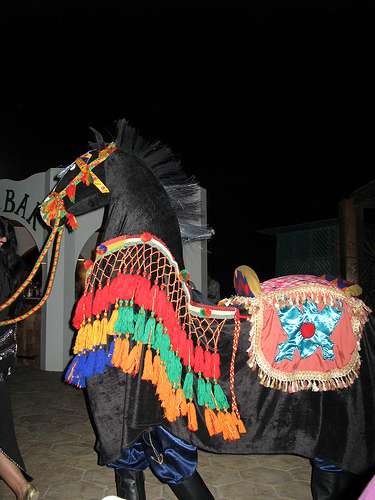 These colourful horses did not always go into battle but instead they were often used by the bodyguards for leaders. Quilted armour is still worn today but only on ceremonial occasions.This particular horse armour was probably used during the Battle of Omdurman (2 September 1898).... " (link) There is another caption here, describing more about the armor. Photo: Kaptain Kobold on flickr. This white horse is beautifully turned out for a procession, carrying a woman and child. The caption describes it as part of a wedding procession, but I wonder if this boy might be on his way to his circumcision? 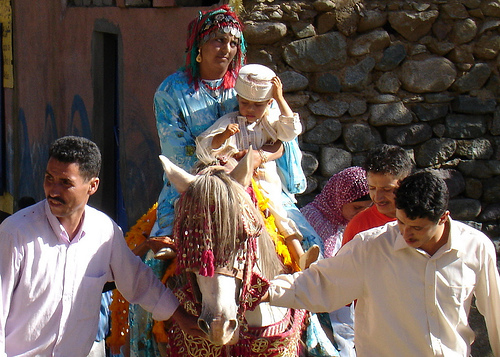 The photo is from a Berber village in Morocco. Photo: Antonio Caselli on flickr. 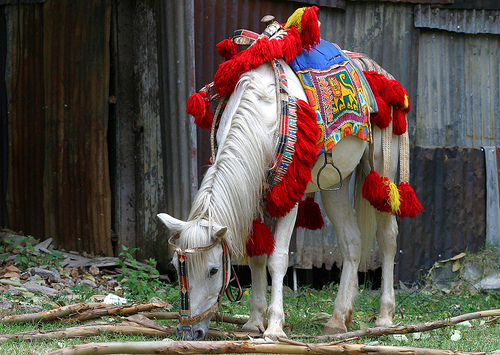 This pretty Ethiopian horse is all dressed up for a parade or festival. 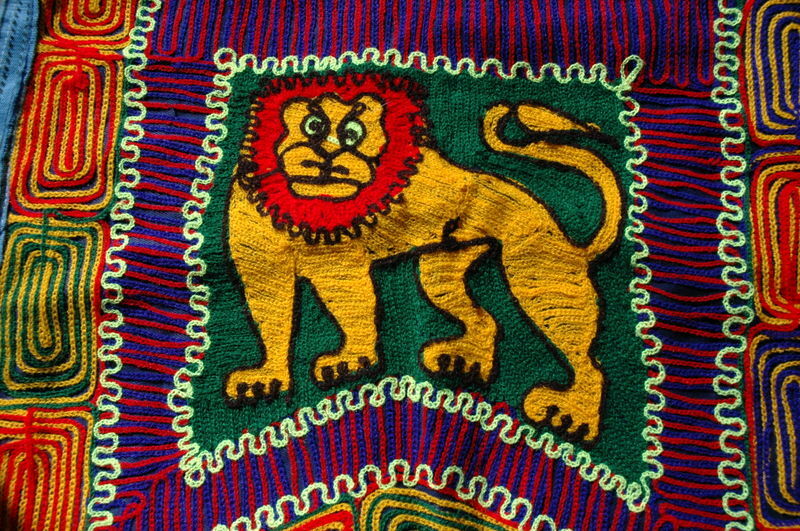 The red pom-poms are a common feature of fancy Ethiopian adornment, as is the blue saddle cloth featuring a golden lion. The saddle cloth hangs over top of the saddle (there are slots front and back for the pommel and cantle to stick through) and is just decorative (although perhaps keeps the rider's leg from rubbing on the stirrup leathers - but it's not padded). Photo: Niall Crotty on flickr. Used with permission. I happen to have a similar saddle cloth, which a friend brought back from a trip there. You can see the detail of the popular lion motif in the second picture (taken by me). The lion, of course, is the "lion of Judah", royal symbol of Ethiopia. Because of that it has also been adopted as an important symbol by Rastafarians.